The percentile map for September, 2016 temperatures shows widespread warmth with scattered records. Graphic courtesy of NOAA. You can try to blame it on the hot air of the political season. Unfortunately, there’s more to the rise in global temperature than that. Though September, 2016 broke the string of 16 consecutive months with record warmth in NOAA’s global land and sea temperature analysis — coming in second to the El Niño-fueled corresponding month in 2015 — there were disturbing trends. The combined global land and sea temperature for September, 2016 was just 0.04ºC (0.07ºF) below the 2015 record. However, temperature changes were not spread evenly around the planet. The land temperature was 0.11ºC (0.20ºF) above last year’s record. If the land temperature were to keep rising at this rate, it would increase by a degree Centigrade (1.9 degrees Fahrenheit) every ten years, a rate far in excess of what most scientists consider acceptable. Even more disturbing is the distribution of warmth between the hemispheres. The northern hemisphere land temperatures were easily the hottest for any September, with particular warmth in the Eurasian land mass. Southern hemisphere land temperatures, on the other hand, were only twenty-first warmest. This is only one month, and anomalies can arise randomly, but climatologists are concerned that global warming will not be spread evenly around the globe. Warming of the arctic more than twice the global average was the first suggestion that this was happening. The northern hemisphere land masses warming at twice the rate of those in the southern hemisphere, as happened this September, hints that wholesale changes in atmospheric circulations are a possibility. Where Was It Hot? Where Was It Not? The cold water south of Greenland and Iceland has persisted for two years. The recent record cold area east of Drake’s Passage between South America and Antarctica has largely dissipated. Large portions of the land masses in the Southern Hemisphere, particularly Australia and interior South America, were near or below normal. October’s Global Analysis will deserve special scrutiny to see if any of the anomalies of September persist. 2016 is on pace to be one of the two hottest years on record, with 2015 in second place. No other year is close. Graphic courtesy of NOAA. 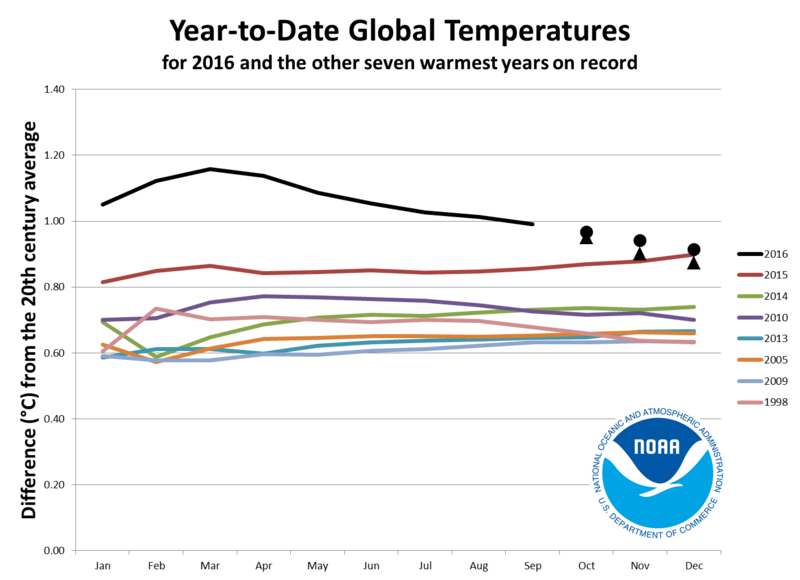 The first three-quarters of 2016 were highly influenced by the strongest El Niño in at least 50 years. 2016 is now ahead of 2015 as the hottest year on record, but if the El Niño of 1997-98 is a good guide, the gap between the two could narrow or even disappear. Considering that a powerful La Niña developed in 1998 and La Niña conditions are less pronounced this year, Decoded Science is betting on 2016 to take over as hottest ever. Whether or not that happens, the last two years will be the two hottest on record, far outstripping the next closest rival. Precipitation departed from normal in several latitude bands during September, 2016. Graphic courtesy of NOAA. A zone of drier than normal weather stretched all the way from the western Mediterranean Sea to Japan, with scattered records from east of the Caspian Sea to Mongolia. In a band parallel to the wet one, it was dry from western Europe to the east coast of Russia, though there were no records. Some stations in the western US were record dry, resuming the four-year drought that was interrupted only modestly by El Niño rains. Most of eastern Australia had record rain. There were clusters of maximum-precipitation records in southwestern South America and southern Africa. These clusters were at roughly the same latitude, again suggesting that global circulation could be changing. Can We Stop The Warming? The graph of temperature with time has had spikes before, but none as pronounced as that of the past two years. Graphic courtesy of NOAA. The dramatic warming of the last two years has put to rest the notion that global warming paused after the last El Niño. 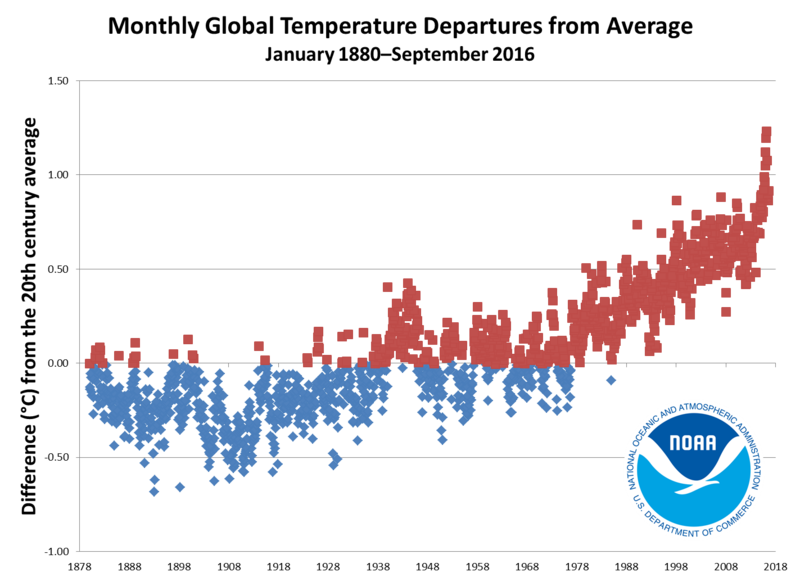 Measured from El Niño to El Niño, the warming has actually accelerated. The steep climb of temperatures in the last two years is unprecedented in modern times. Last year’s climate treaty (COP21) to limit production of CO2, and the recent agreement to eliminate use of HFCs, indicate that the world’s political leaders are finally listening to Mother Nature. The question is whether it is too little, too late. Man’s ability to control his environment may not extend to the general circulation of the atmosphere.